From the Land documents clothing made by the Dene, the Athapaskan-speaking peoples of CanadaÕs Northwest Territories, from the late eighteenth century to the present day. Information has been gleaned from a variety of sources, including the writings of traders, explorers, and missionaries, Native oral traditions, twentieth-century studies by anthropologists, and recent publications by Dene individuals and groups. Excerpts from interviews with Dene seamstresses are interwoven with the text. From the Land contains a wealth of visual material, from early sketches and paintings, to recent photographs, patterns, and illustrations of clothing from museum collections. Through Hollywood and TV, people have become familiar with the western Indian tribes such as the Lakota and Cheyenne. But in the East, the Wabanaki-Abenaki peoples have had a tremendous influence on American history as well. 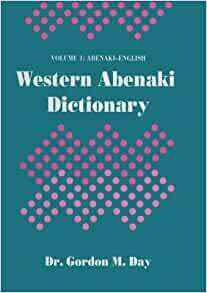 This Abenaki-English dictionary captures an extremely difficult language and fosters cross-cultural understanding. Although it's a bit awkward to look up specific terms because the Abenaki terms are listed first, not the English ones, this is a valuable treasure to writers, scholars and anyone seeking to gain greater knowledge of the Abenaki people.